The CREE XM-L T6 LED Zoomable Flashlight is also sold as an UltraFire product and suffers from quite a few copycat versions on the market. This is one flashlight that seems to get mixed reviews and users either love or hate it; as a result it scores 3.7/5.0 from existing users on Amazon. Selling on Amazon, the Cree XM-L Zoomable Flashlight uses LED technology and claims that the LED bulb will lasts for at least 100,000 hours. The flashlight has 3 modes; High, Low, and Strobe. It only has one white LED bulb and has a maximum beam lighting distance of 250 meters. You get two battery options with this flashlight. Firstly, you can use 3 AAA batteries or use one 18650 battery. Operating on high beam, the runtime is about 2 to 4 hours. Depending on who you buy from, you can have it delivered with batteries and pay more. According to some customers, the flashlight has some serious charging problem if you use the rechargeable 3.7 v battery. 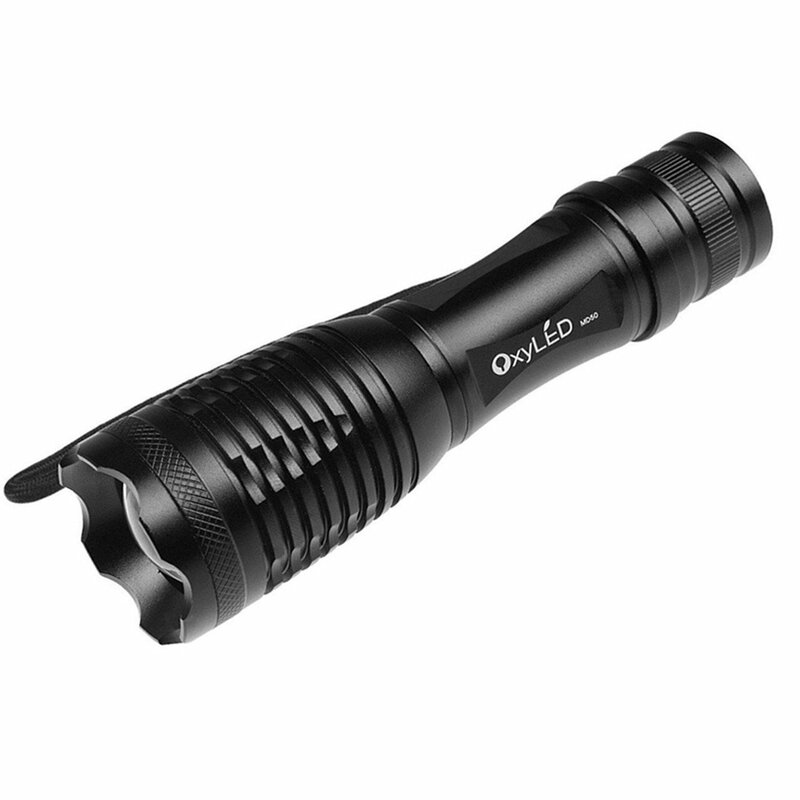 This black aluminum flashlight is compact and easy to grip. It can take rough handling. The craftsmanship and material used for the casing is remarkably good quality. One issue you may encounter with this flashlight is the zoom. You might need to apply some WD-40 to get it to turn smoothly. This tightness can be easily resolved as long as you don’t force-pull the ends too hard. Performance-wise, the flashlight is not 1600 lumens although it has a good beam. The main problem is that with the product name customers are expecting a tremendous flood of light and seeing something half of that is frustrating. According to other flashlight experts, with the triple AAA batteries, it would be impossible to achieve 1600 lumens and the maximum would be about 1000 lumens if it is powered by 10 watts. That would be equivalent to 100 lumens/W. The 1600LM Lumen Zoomable Flashlight receives extreme feedback from its buyers. The rating is 3.7 out of 5 stars although a deeper look at the comments posted reveal ratings of 1 star or 5 stars hence the middle 3 star. For the price, there are many other flashlights that will do a better job although appearance-wise, it looks great. For a mini flashlight the CREE 300LM Mini LED Flashlight is a recommended with a customer rating of 4.3/5.0 and amazing discounts of over 80% off retail. The 300LM flashlight has 3 modes: high, low, and strobe but since it does not come with an instruction manual, you will just have to play around with it to get an idea of how to operate it. It also uses only 1 regular AA battery although you can also use the alkaline, rechargeable 3.7 volt, or the lithium 3.6v. The CREE 300 LM Mini LED Flashlight is 3.7 inch beauty that originally sold for more than the present cost but is now available on Amazon for an affordable price. The price drop is astonishing considering what you get from the product. At face value with 3 multi-function modes of high, low and strobe, it would appear that the CREE 300 LM Mini LED Flashlight is just an ordinary LED illumination device. However, the 300 lumens is bright for such a small flashlight which makes it comparable to the professional flashlights used by emergency teams and law enforcers. Since it is mini, this flashlight is handy for camping, cycling, hunting, or for your bedside, car, or in every room in the house. Although it only has an On/Off operation, you can adjust the focus. This will allow you to spread the beam and widen your scope. If you use the energizer lithium double A battery, you get around 3 hour’s runtime use. After 2 hours, the brightness starts to dim so you can estimate another one hour use from the battery. You will need a screwdriver to replace the battery. The compartment can be found under the power button. The CREE brand is made in Hong Kong which tends to deter customers based in the U.S., and other countries. It is understandable to be skeptical about goods from this part of Asia but CREE products have built a good reputation in quality and performance. For instance, if you shine the flashlight in the dark and point it across a street, you will be able to see what’s across the street and the beam can be adjusted to pinpoint specific points across the street. It has a beam range of over 200 feet. Another good feature about this flashlight is the battery choices. You are given a choice of the regular AA, alkaline, the rechargeable 3.7 volt, or the lithium-ion 14500 3.6 volt. And you only need to use one, which means you will almost always have a spare close by. 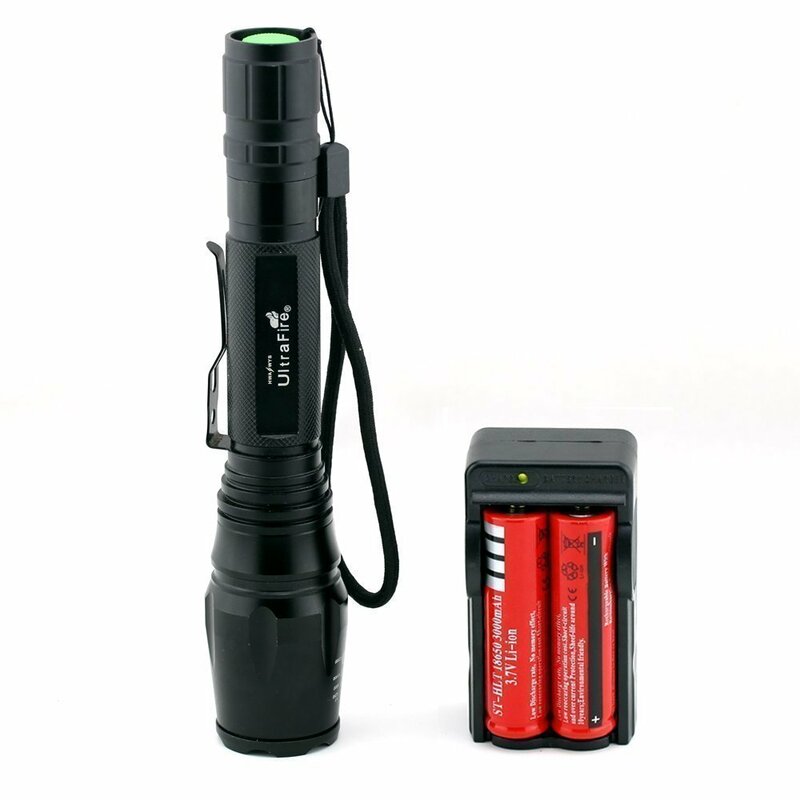 With the lithium battery, the flashlight will shine brighter but have a shorter runtime and the flashlight will get warm after a few minutes. As far as aesthetics, the flashlight comes in all black and has a convex lens. It has a rugged look similar to the larger, 5 inch CREE SA-9 7 watt model, known as its big brother. On the downside, it has no lanyard, holster, or sleeve but it does have a removable belt clip. Also, it’s likely that you won’t get a manual but that shouldn’t be a problem since it doesn’t have a lot of features. A few minutes playing around with the CREE mini will tell you all you need to know. More importantly, the flashlight has a warning regarding possible use of chemicals that may cause birth defects and cancer. However, this warning is standard for all products that come from Hong Kong or China. As far as CREE products are concerned, there has not been a single cause for concern or case filed. With Amazon, the CREE 300 LM Mini LED Flashlight earns a 4.3/5 star ratings. The real clincher for this flashlight is the low price and the brightness of the flashlight. It would be very hard to find another flashlight that comes close to this CREE model except for another CREE flashlight. Definitely, this is a must-buy and a keeper. Ultra Bright CREE 1600 LM LED is a long size flashlight of 8.1 inches that has an original price of a normal high end flashlight but you can find it now with a lower price at many online retailers. The price drop is astounding considering what you can get from this flashlight. We rate it a 3.7 out of 5 because some allegedly received a fake product. It is better to be careful and make sure to order legit ones. The CREE 1600 LM switch has five modes: High, Medium, Low, Strobe and Sos. It does not include an instruction manual so you will just have to play around with it to get an idea on how to use it. It needs two 18650 battery to operate. When you buy this flashlight on Amazon, it comes with two rechargeable high capacity 3000mAH 18650 batteries and dual channel Smart Charger. This flashlight is super bright and has a blinding effect. With a max brightness of 1600 Lumens, the CREE 1600 LM is a perfect choice for camping, hunting, tactical situations and night patrols. Its design is compact, light and easy to handle making it an ideal emergency LED flashlight to help in targeted search, emergency assistance and other types of outdoor lighting demands. It’s also great for household use. It has a soft touch on/off button with two modes; a firm press switches the light on and off and a slight press that changes through a sequential series of functions (High, Medium, Low, Strobe, and SOS). Adjustable focus flash lamps with zoom in or zoom out; slide the flashlight head back and forth to widen or spot beam. Wide beam yields a round bright beam while the narrow beam yields a square (same shape as the LED) bright beam that will illuminate things at an unbelievable distance. The CREE 1600 LM has a high quality construction with a sturdy feel that predicts a long useful life. Life span is up to 100,000 hours or more without the need of replacing the cap. However at 8 inches in length, it may not be ideal for people looking for portable or pocket-size light. It is waterproof, but never put it in the water for a long time. Its top grade aluminum casing resists rust and corrosion, the compact size and convenient strap is for added mobility. The CREE brand is made in Hong Kong and China which tends to discourage users from the U.S. and other countries. It is comprehensible to be skeptical about products from these countries but CREE have established a good reputation in terms of quality and performance. This flashlight can illuminate objects even across the street. It has a beam range of over 500 meters. The use of 18650 rechargeable batteries is practical for the following reasons: lower cost over the lifespan of the batteries and the environment-friendly effect of using the same battery over and over again. Included in the package is not only one but three dual channel 3.7v Li-Ion smart charger (if you buy on Amazon) with a LED indication for Power On, Charging and Full Charge. The determining factor for the CREE 1600 LM is the affordable price and super bright beam with five modes which can illuminate up to 500 meters in distance. It is indeed a powerful flashlight with a sturdy construction and compact design, all for a great price. The only drawback of this product is the charging time which can reach up to 6 hours due to the type of battery being used. On the other hand, long charging time means long running time for this flashlight. It would be difficult to find another of this kind of flashlight but except for another flashlight by CREE. Five Modes: High, Medium, Low, Strobe and SOS. Low power consumption, long running time. Having a good and functional flashlight kit is already considered a necessity in every household. This is obviously the reason why manufacturers are constantly coming up with new kits that would offer something new to the consumers. Among the popular flashlights would be those that are made with LEDs. If you are on a budget, there can only be few things to consider when looking for the right flashlight kit depending on your needs as a user. Basically, you only need a kit that comes with a charger, lithium-iron battery and a flashlight, of course. Now if you are looking to get the most out of the modernized LED technology, you would specifically need high voltage to make it work. This is where the Cree OxyLED MD50 comes in. The MD50 is a 500-lumen OxyLED model that offers several features which most consumers find really useful and handy. With a rechargeable and removable lithium-iron battery, you can say that it is worth the introductory price, or perhaps, you are getting more than what you have paid for. Alternatively, it can operate on AAA batteries too, making it easier for you to switch from the rechargeable one to the AAA batteries whenever you need it. The kit includes 18650 sleeve, an 18650 lithium-iron cell with an AC wall charger. Interestingly, it is also worth mentioning that the light can take a 26650 cell even without using the sleeve. Light Output – Using a T6 light source from Cree, the OxyLED MD50 can easily put out 500 lumens as previously mentioned. As far as the most reviews are concerned, this equally means a bright lamp that works effectively and durable, too. Push/Pull Focus – The Cree OxyLED MD50 boasts of its ability to be zoomed depending on different scenarios and requirements. You can easily adjust the scope from a tightly-controlled view to a wide filed one with the help of its push/pull focus run. Do this simply by pulling the head of the flashlight to focus its beam. Brightness Levels – MD50 is literally a blue light with different brightness levels. Truth is, this blue light is what makes it excellent when it comes to lumen level outputs. The Cree OxyLED MD50 comes in three brightness levels and it additionally has Strobe mode and the SOS mode which is essential for the flashlight to meet the different lighting needs. These two additional modes can also be called as “disco modes” by some flashlight users. Lifespan – With the technology of Cree LED, this flashlight is expected to have a lifespan of 50,000 hours or more, averagely speaking. This is definitely something worth considering since this flashlight is way cheaper compared to other flashlight kits available in the market today. IPX-6 Feature –This water resistance feature makes it possible for the Cree OxyLED MD50 to function effectively even in heavy rain. This is surely a feature when looking for a compact flashlight in an affordable price tag. For those looking to purchase a decent flashlight that offers these features, the Cree OxyLED MD50 is a smart buy indeed. Most consumers claim that this kit is easy to use and the built looks well-guarded, considering that it is made from aluminum alloy, if you are worried about water intrusion and dirt. It is also easy to carry and very lightweight. The black color is also notably sleek-looking and very edgy, not to mention the size that is just about right for those wanting to have a flashlight that’s not too big and not too small, either. However, if you are looking for something that you could use for longer hours, this might not be a good option. The charger is also not much of a great quality, as some reviews have complained about that, too. So if you are planning on upgrading your cells eventually, you might also want to consider purchasing a new charger to keep up with it. At the end of the day, though, it is actually easy to recommend the Cree OxyLED MD50 after weighing out all the advantages and disadvantages that it has to offer. For a great price you get these features that are mostly offered on a higher SRP. With the IPX-6 feature and the brightness level modes, this flashlight is sure to remain popular for those looking to get an economical, easy to use and functional flashlight.